The article explains spirits used in Part III – Summary of Distilled Spirits of the TTB Report of Wine Premises Operations in vintrace. 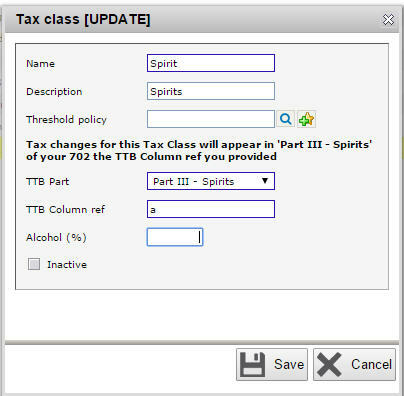 The special tax class Spirit is automatically created for you in Winery Setup > Policy > Tax Class. 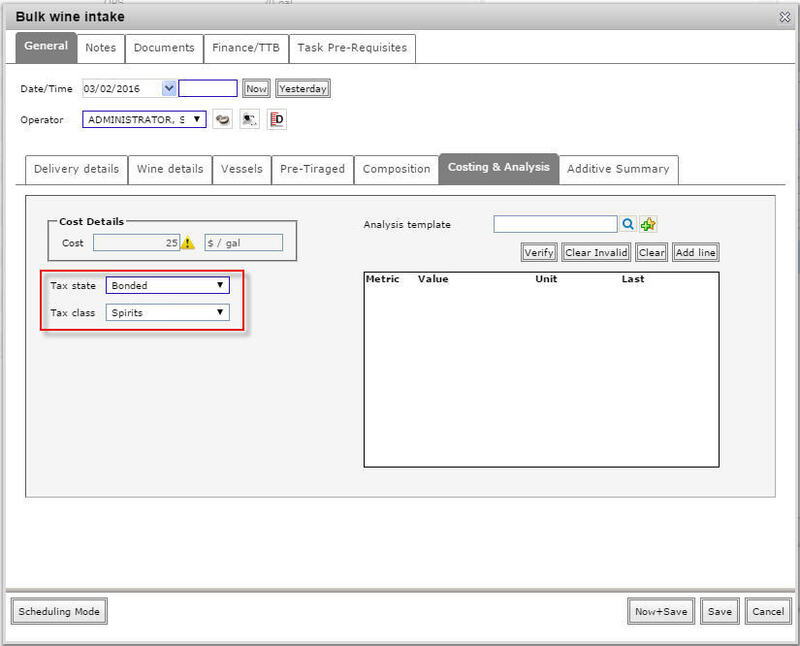 This will allow the correct values to be calculated/displayed on the TTB report (aka 5120.17). The Alcohol % is required since this value will be used to calculate proof gallons in the TTB report. Any TTB event for this tax class will report in Part III column (a) in the TTB report. 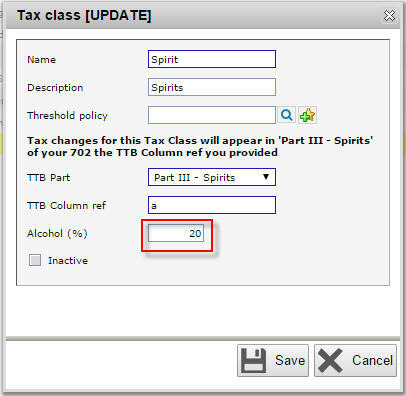 If you more than one alcohol %/proof, you may create additional spirit tax classes; add one (named appropriately) for each additional alcohol % and specify columns “b” through “d”. Use a standard Bulk Wine Intake to receive the volume of spirits and put it into a batch/vessel (tank, barrel, keg). You will be able to give the spirits product all the grape origin information you require as with any bulk wine. The most important option is to ensure you give the spirits product a Tax state of Bonded and select the Tax class Spirits that you set up in the previous step. 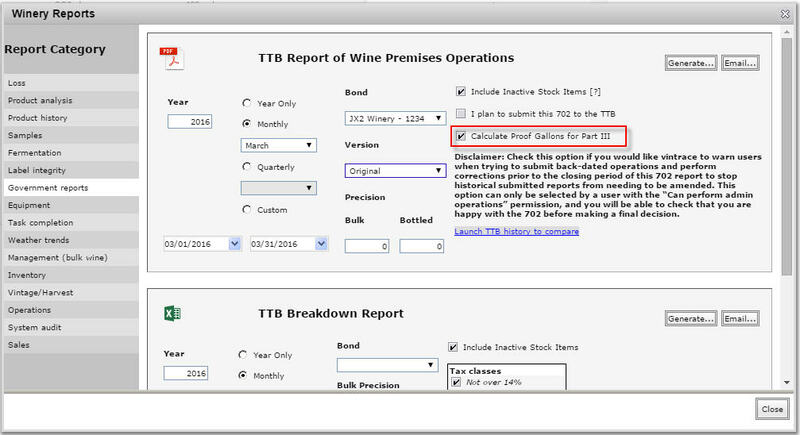 Upon generating your TTB report, you have the option to view Part III in either proof gallons or gallons. The TTB requires reporting by proof gallons. Tick on Calculate Proof Gallons for Part III checkbox when you want to see the spirits reported in proof gallons. 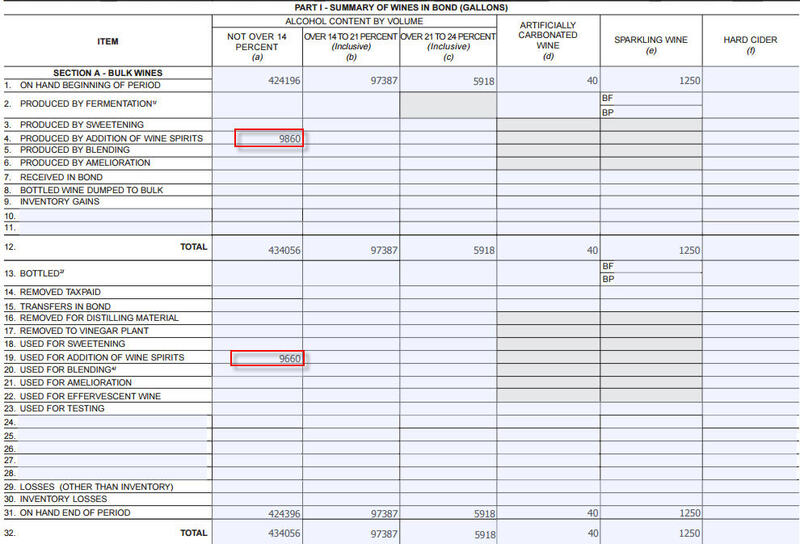 The bulk intake of spirits we have done in the previous step is reported in Part III row 2 Received, under column (a). 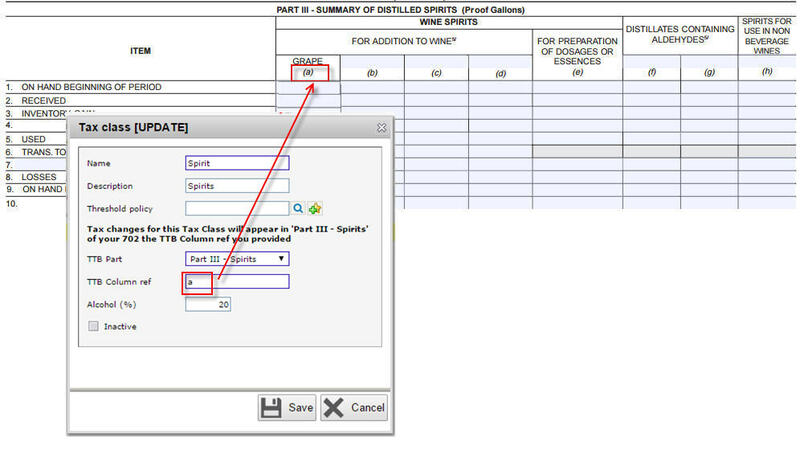 In the below example we have generated the report in proof gallons for spirits. For information on calculating proof gallons, click here for the TTB conversion table and formulas. Reminder: the TTB (or 5120.17) report will display proof gallons. All other reports (Bulk stock, Tax Breakdown report, etc) will display the real volume in gallons. You can use spirits in any of the transfer operations in vintrace. Important Note: the wine into which you are blending must already have been declared as vintrace doesn’t allow blending of declared and non-declared products. Once you complete the operation, the spirit used will be reported in Part III row 5 Used (shown in proof gallons). The wine involved in the blend operation will be reported in Part I Row 4 Produced by addition of wine spirits and row 19 Used for addition of wine spirits. Depending on the volume of spirits and the proof (alcohol % doubled) blended into a wine to fortify it, you may need to change the tax class of the resulting blend. First, create a new Product Treatment (Winery setup > Treatment > Treatment (Product)). In this example, you know that the resulting blend has moved from the 14-16% Federal tax class up to the 16-21% class. Find your Spirits batch (make sure you choose the correct one if you have multiple batches of differing proof) and start a Transfer (Transfer, Blend, One-to-many). Notice the Treatment chosen is the new Change tax class 16-21% fortified treatment. You will be prompted to confirm the new tax class and the class change reason (Produced by the addition of spirits).